Designed and ordered Christmas cards. I used Vista Print, which I’ve done many times in the past. Their prices are good, and the templates are fairly easy for uploading photos or art work and text. 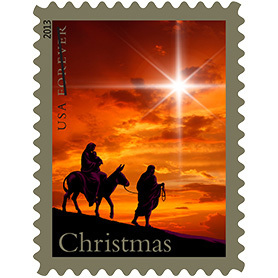 Ordered 100 Christmas stamps from usps.com. Updated my Christmas card list, which I created as an Excel document several years ago. This is always a bittersweet exercise, as I delete those who have passed away since the previous year, something that happens more often as we get older. But it’s also a joy to add new friends to the list. Looked over my 2015 Christmas gift list (yes, I keep these in a file) to see what I gave everyone last year. I’ve already ordered (and received and stored in a closet) gifts for several friends and Goddaughters. Watch for sales now—especially for fun personalized items—and don’t wait ’til the last minute. Made airline reservations for our trip to Denver to be with kids and grandkids for Christmas again this year. 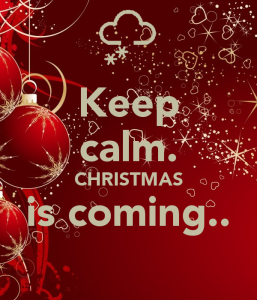 Every year I talk with friends who are stressed as the holidays approach. Usually it’s because they don’t get a head start on the season’s activities. Maybe this post will encourage some folks to start planning and hopefully have a joyous season this year. And did anyone notice I’m not using “Mental Health Monday” any more? Thanks for the replies to Friday’s post… I’m going to discontinue using themes for now. We’ll see how it goes without the structure. If I get lost I can always reinstate them! Meanwhile, here’s a little something to help you get into the Christmas spirit.